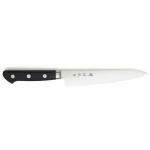 A good chef’s knife is an essential piece of any kitchen cutlery set. It’s your workhorse. 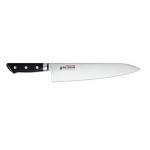 With the way the blade is shaped, a chef’s knife can be manipulated to chop, slice, dice, and mince. Think of it as an “all-in-one” knife. The heaviest part of the blade, near the bolster, is best used for chopping. Slicing and dicing tasks are meant for the middle portion, and the knife’s sharp tip makes quick time of mincing. Since you’ll be using this knife a lot, don’t skimp on quality. Look for blades that are made from quality materials. Terms like high carbon stainless steel, Solingen steel, and VG-10 are a good place to start. Stainless steel that is “high carbon” will not only be resistant to stain or rust, but it’ll also hold an edge for a very long time. 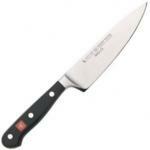 The term Solingen references a city in Germany that’s renowned for its production of high quality steel, and companies like Henckels and Wusthof often use Solingen steel in their knives. And in Japanese cutlery, VG-10 is a commonly seen term. This type of steel is easily sharpened and is an excellent strength for basic kitchen chores — just not a lot of heavy chopping. A forged knife is superior to its non-forged counterpart. The forging process ensures a strong, sturdy product, since the edge is created during the heating process. Stock knives that aren’t forged are shaped after being heated, which means there’s excess metal coming off the blade. Most quality knife manufacturers will only produce full tang knives. This means that the portion below the blade, or tang, extends fully into the handle. This construction provides better balance, more leverage, and less chance of the knife breaking if overworked. You’ll also notice that chef’s knives come in a lot of different lengths. This is like trying on a shoe size; different lengths and weights feel more natural to some than to others. If you get a chance, step into a knife shop and try hefting a few different lengths of chef’s knives in your hands to see what feels best and “balanced” to you. The Henckels International Classic Forged 8-Inch Chef’s Knife is a basic, sturdy Western or European design that requires minimum sharpening — but if you are so inclined, the steel is such that you can use different grinds on each portion of the blade to enhance its work-ability. It also comes with a lifetime warranty. 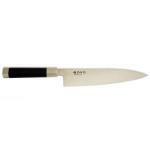 If you are drawn to Japanese cutlery, take a look at the Suisin Special Inox Knife. Its blade is thin, yet still quite strong, and traditional Japanese sword smith techniques are used to forge the sleek AUS-10 steel blade. The Shun Classic Damascus Chef’s Knife is a knife to see if you’re wanting the best of both worlds, i.e. Japanese blade construction fitted to Western patterns. The edge is extremely sharp and requires very little maintenance to keep it that way. But since it’s made of VG-10 steel, use it mostly for slicing tasks and go easy on the heavy chopping duties — otherwise, you may need to sharpen it more often. And now for something completely different: the Alton’s Angles Chef’s Knife by Shun and celebrity chef Alton Brown. It’s a full tang VG-10 Damascus steel knife with raised handles, giving chefs more room in between their knuckles and the kitchen countertop when using the knife. This style isn’t for everyone, but if your hands need that extra clearance room, the Alton’s Angles Chef’s Knife is definitely worth a shot. 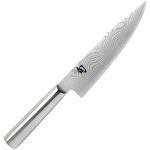 I will not steer you away from this knife--it's a Shun knife, in their VG-10 Damascus layered steel pattern. I doubt that anyone can say there's a better practical cutting edge around. I do have some concerns about the handle, though. With a few concessions to the advantages of modern stamped steel blades, this Wusthof Gourmet Chef's Knife is in some ways an improvement over the heavier forged steel patterns that made the company famous. Offered exclusively through Korin Trading in the US, and their sister companies in Europe, Togiharu knives have quickly established a reputation amongst professional cooks and serious amateur cooks for their thin geometry and fine performance. In the realm of kitchen knives, Japanese virgin carbon steel is considered amongst the most desirable of blade materials. What makes Virgin carbon steel so special and why does a virgin carbon steel blade offer such fine performance?